It’s likely you have spent days deciding between the PlayStation 4 and the Xbox One. You might have even spent a considerable amount of time looking for the perfect game. But how much time have you spent looking for the best gaming chair? Like many gamers, you might have overlooked the benefits of a comfy seat. How many times have you gotten into the flow of the game, only to feel uncomfortable an hour or so later? We’re guessing quite a lot. If you want to maximize your gaming experience, you are going to need a comfortable chair. You can then play to best of your ability, as you will feel relaxed and focused on the game. To help you enjoy a PlayStation 4 game to the full, we have picked the coolest PS4 gaming chairs on the market. 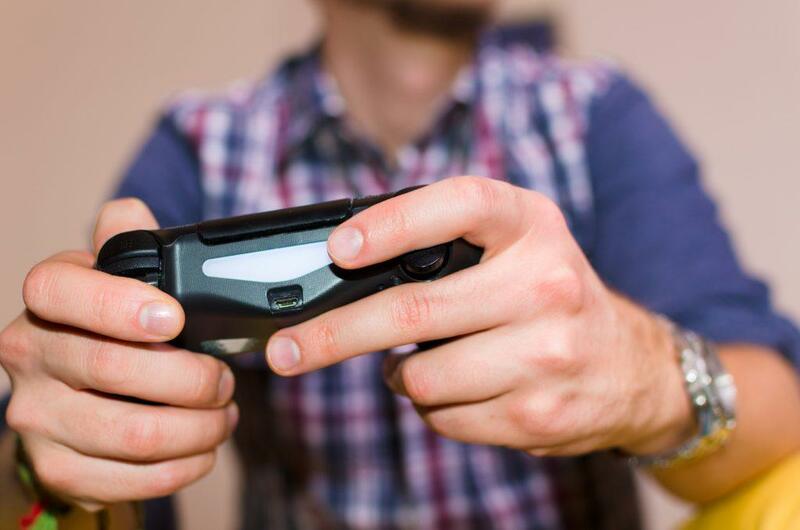 The average gamer reportedly spends 22 hours per week playing video games. So, the one thing they are going to need is a comfy chair. We’re not exaggerating when we say that the X Rocker Pro H3 could be one of the best gaming chairs available. The only downside is that it might be one of the most expensive. Is it worth the expensive price tag? We like to think so, but you would have to be the judge. The sound speakers are perfect for gamers who love to crank up the volume. So it can provide an immersive experience into a game. The chair speakers also mean you won’t even need to add sound to your TV. The great thing is, it’s not restricted to being a PS4 gaming chair. You can use it for watching TV or listening to music. The chair definitely lives up to its name, too. The smooth rocking motion offers a comfortable experience. You’ll find yourself rocking away in the sleek chair without even realizing. You only need to take one look at the chair to know it oozes comfort and luxury. It’s easy to spend many an hour sitting on the thick, luxurious padding. Don’t forget to turn on the vibration to relax your body. The bass tones will counteract the tension of explosive battles or crashes during a game. Many gamers might not want to buy a PS4 gaming chair due to lack of space. If this is the case, you should definitely consider the Giotek RC-3. The foldable design allows you to pull out the chair during a game, and then store it away when not in use. With a luxury black fabric and red trim, it’s as cool and sleek as any gaming chair, but with greater flexibility. You also don’t have to worry about spending hours setting it up, as it folds out in an instant. Unfortunately, if you are not a skinny, small adult, this might not be the PS4 gaming chair for you. The design targets both teenagers and children. So, it might not be the most comfortable option if you’re a grown man. Unlike the X Rocker Pro H3, you will have to wire the Giotek RC-3 to produce any audio. You’ll also have to connect it to a power outlet. The X Rocker Triple Flip Chair is ideal for gamers looking for something a little more homely. The traditional armchair design can blend into almost any interior. Yet, it offers a luxury, sleek design to ensure it becomes a focal point. Thanks to its solid construction, it’s ideal for tall gamers. So, whether you’re 5ft 5″ or over 6ft, you’ll feel comfortable during hours of gaming. The PS4 gaming chair will also be fully-assembled. So, all you need to do once it arrives is connect it to your TV and start the game. A big advantage is the Triple Flip offers a handy storage compartment under the chair. It’s the perfect place to store your games, controllers, headsets and more. With two speakers and a subwoofer, it offers a 2.1 sound experience that’s great for gaming and music. The X Rocker II is the improved version of the original X Rocker gaming chair. The most notable difference is the wireless audio. So it allows a gamer to enjoy a more immersive experience. Yet, you will still need to plug the cord into a power outlet to enjoy the benefits of the chair. There’s also an option to plug a headset into the chair’s headphone jack if you’d like to go into stealth mode. Again, this is another great PS4 gaming chair for those looking for a design they can fold away. The foldable construction will allow for easy storage and portability. All that gaming can play havoc with your back, right? Well, this chair can help, as it offers an ergonomic design for full back support. So, you shouldn’t feel too stiff and sore when you stand up after hours of gaming. You can even flip the arm rests up and down, so you can push them down when the game gets real. You only have to sit on the X Rocker Pro Series to realize why it has become popular with gamers. Not only is it one of the most comfortable PS4 gaming chairs, but it offers a soothing vibration. You’ll also be happy to know that it takes a few minutes to set up the chair. It also won’t take much longer to sync the wireless speakers to the TV and console. Yet, if you are looking for a crystal clear audio, this might not be the chair for you. Don’t get us wrong, the sound quality is great, but there are better chairs out there for audio. The PS4 gaming chair also comes with extra ports for headphones and mp3 hookups. What’s more, it can connect to other chairs. It’s also pretty flexible and supportive, as you can tilt or swivel, and you can enjoy an ergonomic design. If you are looking for something a little more lightweight, we recommend the Cohesion XP 2.1. 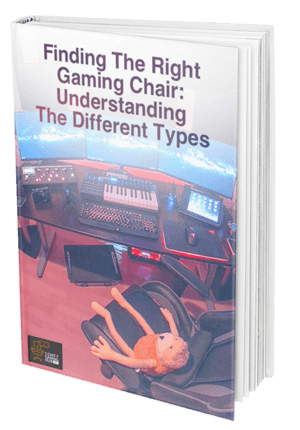 This comfortable chair is ideal as a first time gaming chair, as you can experience its many benefits. It is also a more affordable option in comparison to some of the chairs listed above. So, it’s perfect if you’re on a limited budget or don’t want to spend too much on a chair. The chair also comes equipped with both in/out headphone jacks and volume controls. So, you can immerse yourself into a game without disturbing the rest of the house. Yet, you can take the headphones out to enjoy two wired receiver audio speakers built in the gaming chair. It’s great for gaming, watching TV or listening to music. You can also fold up the chair for easy storage when not in use. Read more about the Cohesion XP 2.1 here. Do you want to fully immerse yourself into a game? You need to check out the V Rocker, then. This comfortable PS4 gaming chair comes with interactive audio. So, it will allow you to both hear and feel the audio. You can sit back and listen to your favorite songs, watch movies or play the best PS4 games. Whatever you do, you will feel part of the whole experience. So, what makes the audio so great? Well, it offers a wireless audio transmission. That’s not all. It features two forward-facing speakers in the headrest, as well as a subwoofer in the back of the chair. The side control panel also puts you in full control of the volume and base control. There are also input/output jacks, and a headphone jack for total immersion. You can even link it to other chairs to heighten the gaming experience. There’s so much more to this chair than great audio, though. This is another chair with an ergonomic design. Need a foldable chair for easy storage and portability? The V Rocker can tick that box, too. What is the Best PS4 Gaming Chair? Did you know that video game software sales rose by 6% in 2016, reaching a whopping $24 billion? With the gaming industry only set to get better year after year, you need to make sure you have a comfy seat at the ready. So, now you know about some of best gaming chairs on the market, you might want to find out which one is the best of the best. Well, that is for you to decide. Each of the chairs listed above offers unique features that rival the other. If comfort is your thing, well, you can’t go wrong with the X Rocker Pro Series Pedestal. If you’re looking for something a little more affordable, it might be wise to select the Cohesion XP 2.1. But if you are wanting an immersive gaming experience, you should consider the V-Rocker or X Rocker Pro H3. Whatever chair you pick, you can guarantee you it will change your gaming experience. So much so that you might wonder why you hadn’t bought one sooner. If you need a little more help making up your mind, click here for the ultimate buying guide. Have you tried any of the chairs listed above? Do you have any recommendations or tips? We’d love to hear your feedback. Feel free to leave a comment below.